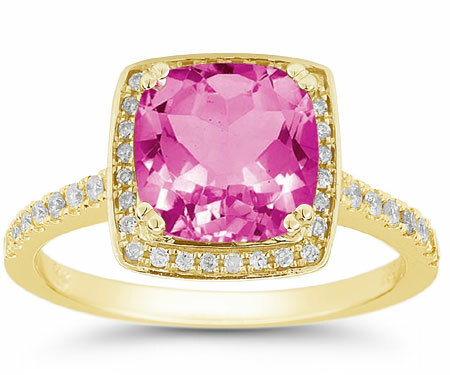 This authentic square cushion-cut AA rated pink topaz and diamond halo ring in 14K yellow gold is a fun and exciting design from Apples of Gold Jewelry and is perfect for all occasions! The cotton candy pink color of the 9mm x 9mm cushion cut pink topaz gemstone is beautiful surrounded by a halo of white diamonds! The diamonds, which are rated H-I for color and SI for clarity, are not only surrounding the gemstone, but are also on the ring itself, creating an additional 0.37 carats worth of sparkle! We guarantee our Square Cushion-Cut Pink Topaz and Diamond Halo Ring in 14K Yellow Gold to be high quality, authentic jewelry, as described above.